ADVANCED COLOR MANAGEMENT TO LIGHT UP YOUR MARKETING! 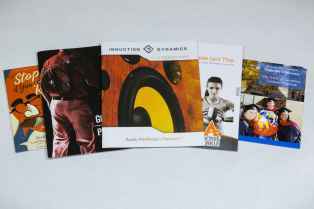 We have built a reputation over 30 years of being one of the finest offset printers in the Midwest. Our production facility, while clean and organized, is run by highly trained and experienced pressmen who understand their craft and practice it like artists. Offset is in our blood and we take very seriously our responsibility to the reputation we’ve garnered and the clients we’ve served. Our pressroom is anchored by the latest in technology from Komori and Heidelberg presses, which range in sheet size from small (14” x 20”) to medium (20” x 28”) to large (28”x 40”). This kind of flexibility means there really is no offset printing job we can’t do. 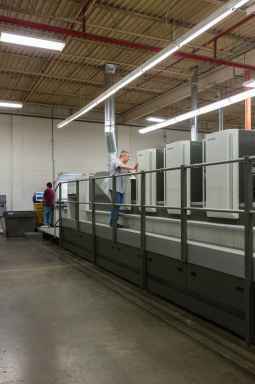 These fully automated presses allow us to “fit” each project on the most efficient press for its run length and shorten the make-ready process, both resulting in cost savings for you. Each of our presses features the ability to add aqueous coating, a finish that not only enhances the look of a project but speeds up processing by eliminating any down time for the ink to dry. Your finished piece looks beautiful and is completed on time. Our machines produce spectacular color accuracy and consistency from the first sheet to the last. Through careful color calibration, we can ensure that the final product is an exact match to your creative design. There will be no surprises and you’ll get what you expected, every time. As our clients say, you can count on us. No matter how large your run size, we strive to provide fast turnaround times on every project with a finished product of unsurpassed quality. Contact Us today and talk with one of our marketing experts and see why we’ve built a reputation for quality in offset printing.